I was 16 and it was some winter that year. My dad, who was chief inspector, took me on the West Highland Railway snow plough on an adventure from Glasgow to Fort William. I was in the leading engine, one of those big monsters that could push through almost anything. There were two of them, with a snow plough equally massive up front. They called it double headed, having two engines working together and I remember the blizzard that hit us coming out of Helensburgh as we made our way towards the highlands and some of the best snow I’ve ever seen. The photo above isn’t our engines but it’s more or less the same, only our’s, to a 16 year old, seemed like gigantic diesel breathing monsters. Looking back now, I wish I’d taken pictures but most of it was at night and I hadn’t brought my camera. Crossing the county march between Tyndrum and Bridge of Orchy, we were ploughing through snow that was higher than the engines and at times was so deep we employed the strategy of stopping, reversing back up the line and charging the monster drift. It was a risky business as that’s how you can derail a plough. If the snow is deep and hard enough, it just pushes the plough off the rails and the two engines have to drag it backwards and hope its wheels fall back onto the rails. That’s if the momentum hasn’t carried the front engine into the drift and derailed it too. We used this method to slowly creep across Rannoch Moor between Rannoch and Corrour and it was light by the time we made it to the remote station in the middle of the moor. By this time I’d been moved to the rear engine in case the front one got derailed and with great difficulty I managed to push down the window and I gazed out onto a sight I’ve never seen since. A white wilderness stretching in every direction across the featureless moor, away to the snow clad giants of Glencoe and the lunar whiteness of the route back to Rannoch. It was simply stunning and completely without sound. Great white dunes of wind sculpted snow, waves of white breakers rolling off into the distance, their surfaces sparkling like diamonds under a clear blue sky. And then the fun began. The station manager got out his step ladders and climbed onto the front of the leading engine and started hacking at the windows with a shovel while his other half took a pick axe to the door. The engine was encased in thick ice from its journey across the moor, backing and ramming its way through monster drifts and everyone inside was stuck until those outside could hack their way in. We stayed at Corrour for a bit, then made our way up Loch Treig side but I don’t remember much about that part. The next scene I do remember, was stopping just outside Fort William and watching one of the leading enginemen jump down, to contact the signal box to let us in and disappearing into the snow at the side of the track! Completely disappeared! They dug him out and got him back into the engine and we made our way into the station in a blizzard. It was dark again by now and the snow swirled in the orange glow of the street lamps and bright white of the station lights. I don’t really remember much about how we got back to Glasgow but it was on a “normal” train, with the plough going ahead of us clearing the way. 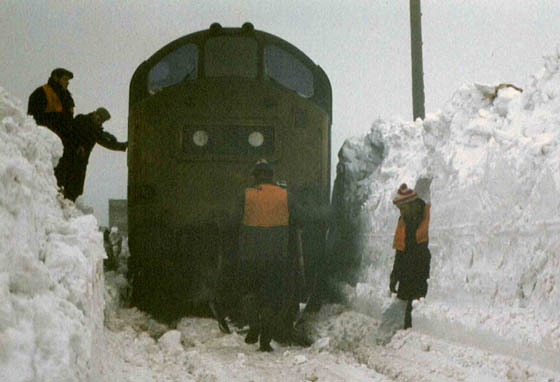 I had a high viz vest on and all the passengers would come up to me and ask what the situation was each time we stopped and waited for the plough to clear the way ahead of us. I felt quite important! In those days, West Highland Line trains had an emergency hamper in the guard’s van and we broke this open and started handing out tea and biscuits to the passengers. If you’re ever in the Bridge of Orchy hotel, have a look for the pictures from that winter. They’ll be on the wall somewhere. They were on the corridor wall for years and they show what it was like. In fact, they show the plough on the line and I may just be in there. A starry eyed 16 year old heading out on a real adventure, with a bunch of hard headed railwaymen joking and laughing their way across some of the remotest land in the country, through snow drifts that could tame the double headed monsters we were riding.